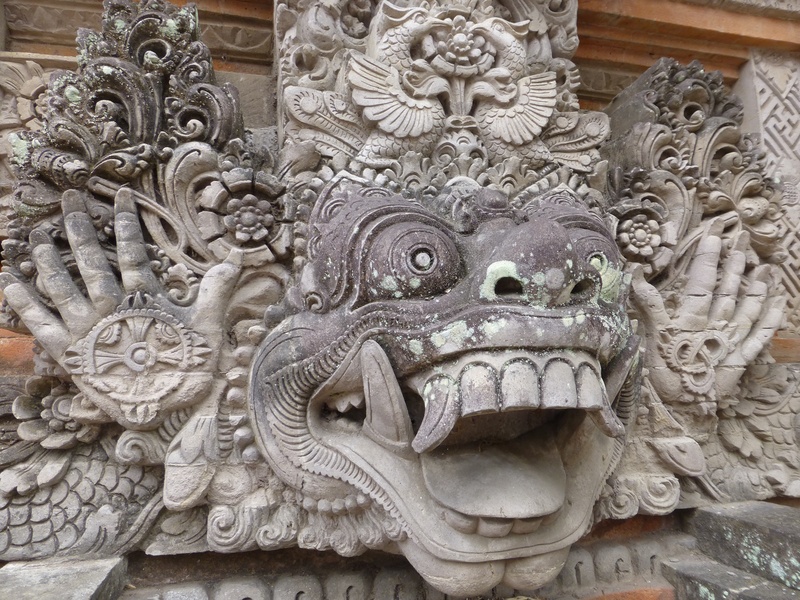 One of my guidebooks describes Ubud as an artist’s community and “the most Balinese of towns”—descriptions that drew me here. However, as of the last seven years, it is probably best known as one of the sites featured in the book “Eat, Pray, Love”—a book that, despite its status as an international bestseller, I thought was a bit, I don’t know…trite. Nevertheless, it seems a lot of people disagree with me because the town has seen a great surge in popularity as a result of the book’s success. People come here to experience a bustling little town densely packed with as many yoga studios, herbalists, healing centers, and spas as there are taxi drivers. Okay, maybe that was a stretch—there are a whole lot of woefully underemployed taxi drivers here. Offerings in the middle of the road. 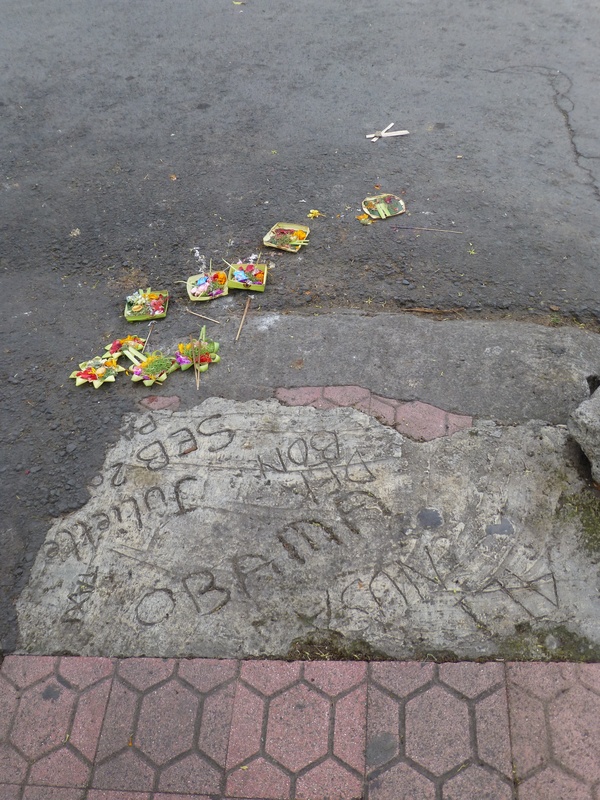 After I took this shot, I noticed Obama scrawled into the sidewalk, too. Incidentally, two of the key figures of the Bali portion of “EPL” now have very lucrative practices right in central Ubud, thanks to the book. The healer is somewhere around 100 years old (therefore, seeing fewer clients nowadays). Apparently, you can see the other person, Wayan, at her own little healing shop and pay quite a sum compared to her competitors. Despite what might sound like a lackluster introduction, I can see that there’s something about Ubud that draws people here regardless of any ol’ book. The town seems to vibrate with the energy of two worlds colliding—the temporal world, full of tourists, nightlife, restaurants, and galleries—and the world “within,” with visible displays of tradition and faith everywhere you go. You cannot step foot outside your door without seeing tangible representations of faith—from the small shrines in and outside of each home, the numerous temples and religious statues—even small offerings that are placed outside of every home and business (you have to be careful where you walk here, because you could be trampling on someone’s offering). Amazingly, this collision of two contradictory worlds seems to work in a way that appears almost seamless. What’s been on our agenda in charming Ubud so far? Aside from a whole lot of listless lollygagging as we adjust to the heat and humidity (neither of which is all that horrible, but still requires adjustment after the 40 degree weather we left back at home) we checked out the Sacred Monkey Forest, which is a lush bit of jungle in the middle of Ubud, overpopulated with scores of mischievous macaque monkeys—the kind that can get a bit nasty if you’re not careful. The Monkey Forest also has several temples within its grounds, one of which is used for elaborate cremation ceremonies. 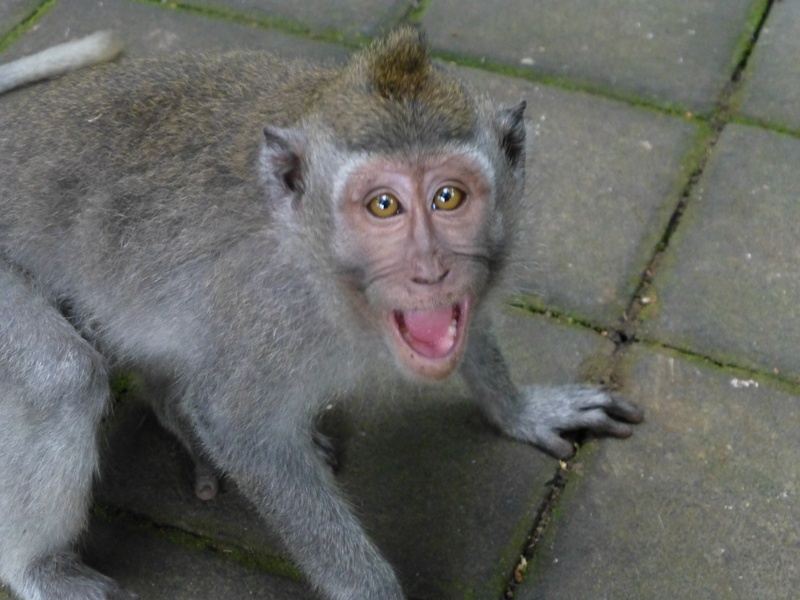 This is what a monkey looks like right before he lunges for your camera. Ubud is also a great spot for long walks. It takes very little time and effort to leave the center of town and immerse yourself in lush rice fields and tiny neighboring villages. Today we took a long stroll along the Capuan ridge (“capuan” means the confluence between two rivers) and took in the gorgeous scenery. Without an actual agenda, we are simply appreciating each day as it comes—a notion I think the locals know all about. Update: We booked a driver to take us from Ubud to Benoa. During the ride, he asked if we had seen the movie about Bali. Interested, we asked about the name of the movie and of course, he was referring to “Eat, Pray, Love.” When we mentioned we weren’t fans, he confessed that the Balinese joke that it should have been called “Eat, Pay, and Leave.” They seem to be as impressed as we are. « Selamut Siang from Bali!